“New drivers and parents often don’t know where to find resources and education,” said Linda von Quintus, Vice President of Government Affairs, AAA Texas. 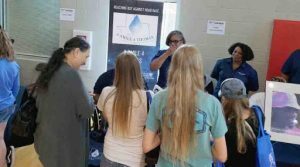 “We are committed to helping our members, local communities and motorists of all ages pinpoint the tools they need to be safe drivers.” The safety fairs strive to educate parents and teens about the risks facing new drivers, and provide them with resources as they prepare to take the wheel. 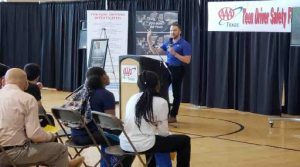 Daniel Armbruster, Senior Public Affairs Specialist for AAA Texas, addresses attendees at the Teen Driver Safety Fair.